Parenting Your Teen aims to help parents of young people aged 10+ to tackle the challenges that come with raising teenagers. 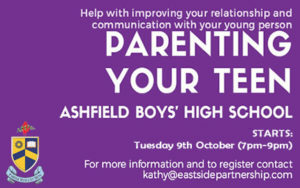 An expert facilitator will guide parents through a range of topics which include setting rules and consequences, teen development, dealing with conflict and problem solving. During each session, practical support will be provided and there will be an opportunity for parents to share experiences and hear from others in a similar position. So whether you are a parent who is feeling overwhelmed, out of your depth or you simply want to prepare yourself for the teenage years, then this is the course for you. This course lasts 8 weeks and will begin on Tuesday 9th October 2018. Each session starts at 7pm and finishes at 9pm. We offered parents with this opportunity last year and those who participated really enjoyed it. Many commented that ‘more parents should have the opportunity to attend’ and how they felt that they got ‘lots of practical support’ and ‘learned from one another’.